After a short debate on where we were going we left Neil's house in the direction of Matlock Bath. 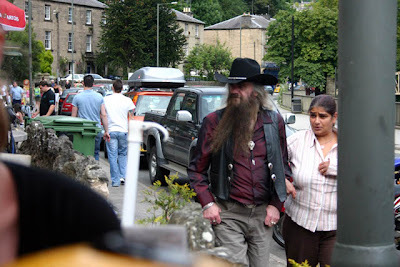 As well as being a tourist attraction Matlock has always been a popular meeting point for bikers. Summer weekends always attract hundreds of bikers. For us lot, well we've done it to death now and I should imagine it'll be a long time before we head back there. 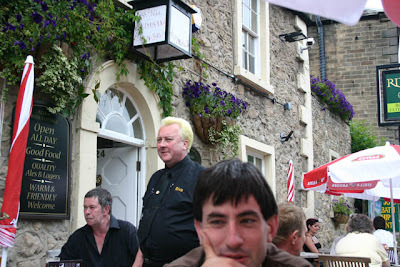 Upon arrival we called in at the Riva, a pleasant little pub/restaurant and did a spot of people watching. As you do. 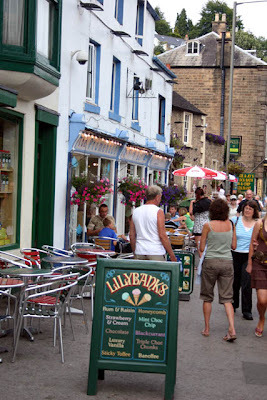 There's one thing about Matlock, there's no shortage of fish and chip shops. Just so you can get your bearings Matlock Bath consists of a road, one side lined with, well mostly fish and chip shops, and the other side there's a river. Gaz and Cara on Neil's bike. 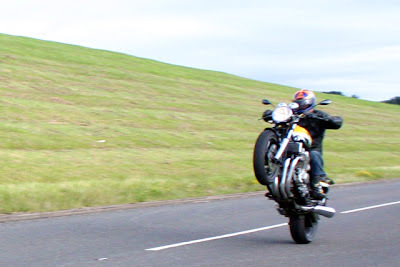 Neil's bike seems to have become the unofficial Jangle stunt bike for just about anyone to have a go on. This you can't fault him for. Fair play. 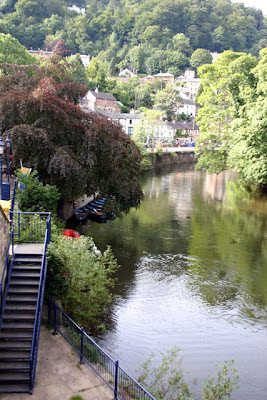 Matlock Bath looks very pretty, but the airfield looks like bucket loads more fun!! Glad the weather held and you all got out! I'm going to have to go out one day and start taking pictures of random strangers to see how they react. What fun! What camera has she sent you? Does this mean she's got a nice shiny new one? who owns the mad mural helmet in the pic of three? and where can i have that done to mine? 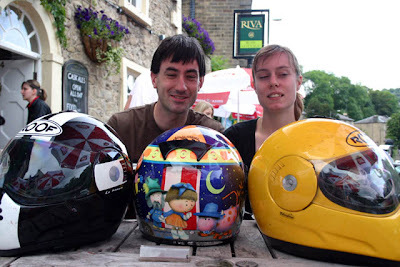 Kate - The Magic Roundabout helmet belongs to Gaz. Ali - Oh FFS you haven't have you? The Magic Roundabout helmet was used by the great late Ronnie Smith. 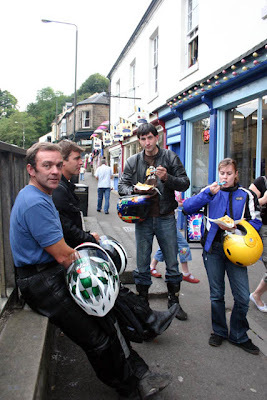 He raced here in Scarborough and won the 6oo race at the TT one year! What a great chap! We have been to Matlcock, I remember it quite well! 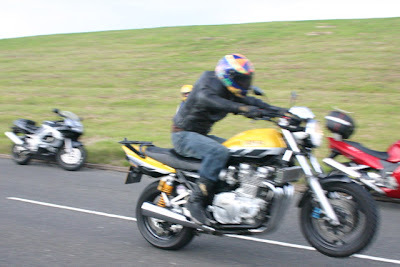 Jon took off on the fireblade after some locals who knew the roads well.....sadly I had just had a dodgy chicken curry! You wonder why you do these stupid things at the time! Still we learn! LOL! What is the yellow bike? Is it an XJ13? 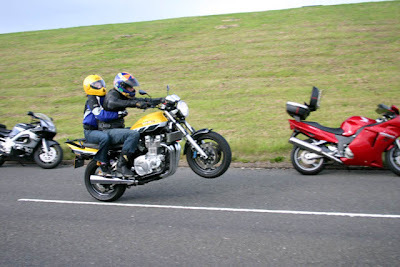 Quite similar to ours, a CB1300. Mrs Nesbitt - It's a Yamaha XJR1300. Fantastic looking place Mike. 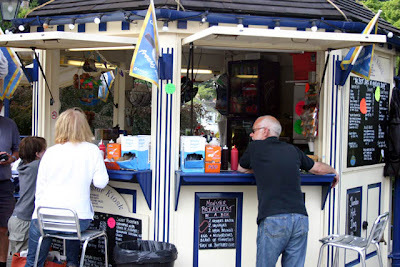 Love fish and chips, haven't had them for years- real ones that is. God I miss the auld chipper. 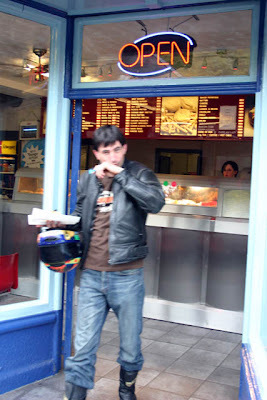 Paddy - You can't beat a bag of fish and chips once in a while. They've never quite been the same though since some do-gooder banned the use of newspaper to wrap them in. The chip shop lady looks on wistfully as Gaz leaves, wiping the taste of fresh fish from his lips. Is that a savaloy in his lunch box? OOOOOOOOOOOOOOOOOOOOOOOOOOOooohh Saturday morning, lovely weather...did I mention am off to Croft tomorrow, BSB! ITV1 at 2.30pm watch out for me, I have a duck backpack! LOL!